I love me some good Vietnamese food anytime, but the best Vietnamese food is when some little lady is sitting there inside her kitchen making it all herself. 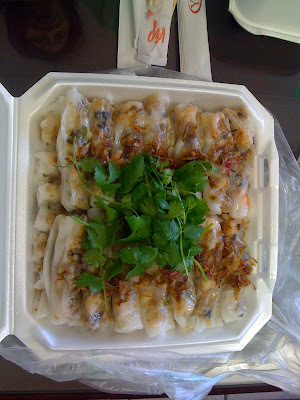 The following are the 2 best home Vietnamese places in the San Gabriel Valley. They work out of their homes, so make sure to call them at least a day in advanced with what you want to order. Lady #1: Call her "Ho yi" (yi as in aunt). 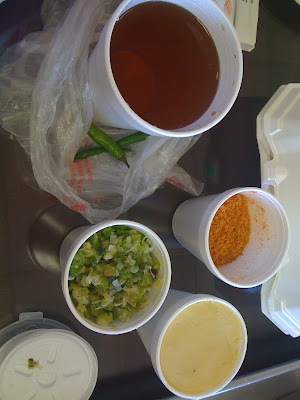 She's at 1321 Pine St. Rosemead and for $13/14, she will give you this. This can feed about 4/5 people. 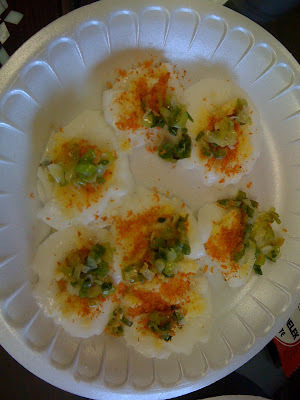 There's layers and layers of bahn cuon inside. It's basically a crepe like thing with mushrooms, shrimp, pork, and bean sprouts inside. Yum! Lady #2 has no name. Just call her lady. Lady is at 212B Avondale in Monterey Park. She makes awesome Bahn Beo right from her home. You take it home like this along with her sauces. She gives you everything you need. There's the shallots, the mung bean paste, the shrimp, the fish sauce, etc. And viola! Bahn beo at home! They're super good. They'd be awesome for parties if my friends actually enjoyed Vietnamese food. If you wanna try them message me for the numbers. May 30 Day Trip To The O.C.